Grandmother and Grandson, Lillian Slinger & Robert Monk, were victorious last Saturday in the Zurich International Mixed Doubles at Finch Hill Bowling club as they defeated the inform Trevor Quayle & Lyn Bolton 21-19 in a closely contested final. As the score-line suggests it was a close encounter from the off in the final with our eventual victors just having enough to see them over the line. In the Semi-finals Slinger & Monk dispatched Philippa Fletcher & Alec Taylor 21-9 after a supreme display whilst Bolton & Quayle saw off Peter Karran & Jo Smith 21-15 at the same stage. Fallers at the quarter final stage were Lynda & Derek Cadamy, Lynda Richman & John Matheson, Kath Kinley & Ron Williams and Paula Firth & Jordan Cain. Thanks must go to Finch Hill for a well run competition and to Zurich International for their appreciated support of the event. 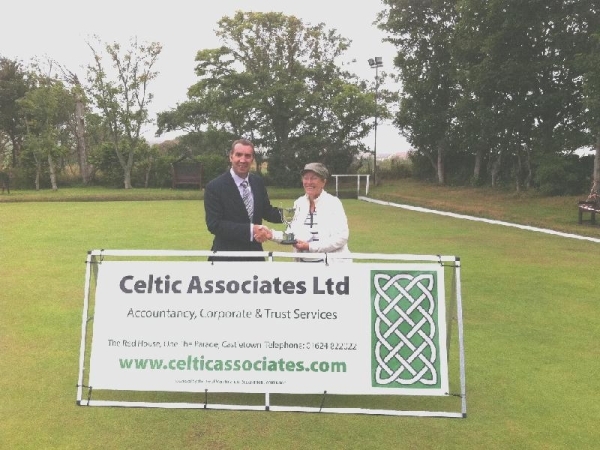 There was an entry of 41 at Port St Mary on Wednesday 14 August to compete for the W. A. Roberts ladies’ singles trophy sponsored by Celtic Associates Ltd. With the green running well there were some very close games as well as some not so close ! The final was closely contested to end 13, when Janet had a slight lead at 14-13. She won the next end to gain control of the jack which she then refused to relinquish winning the next five ends to come through 21-13. Lady President, Sheila Shimmin then thanked the green keeper, Shaun for doing the sheet and anyone else who had helped during the afternoon before introducing Iain Wood, director of sponsors Celtic Associates Ltd to make the presentations. Iain said that the company were pleased to be involved with the competition and would be pleased to sponsor it again next year. Getting Tight At The Top! League leaders Marown A had to fight for their lives to overcome a battling Douglas A side 6-4 at the memorial playing fields on Monday. Douglas, the only side to defeat Marown this season, got so agonisingly close to picking up a famous win in almost a carbon copy of this year’s Rayner Shield final. Marown moved into a 3-1 lead at the half way stage before the Villa men fought back to lead 4-3 with one game left on the green, John Gelling was always in control of the final match for the home side, but it was all about the aggregate points. Ken William’s dug in for his team but fell just short with Marown picking up the two bonus points by just two points. Onchan A had to win big to keep the pressure on the leaders and they performed this task magnificently picking up another maximum win this time against Castletown B. There are now only two points separating them and Marown with three games to go, and both teams will be looking to pick up maximum points at home tonight to keep their title bids on track. A slip up from either side at this stage would open the door for the other to walk through and grasp the league trophy. Third placed South Ramsey sat out on Monday but played a rearranged fixture against Ballaugh A on Wednesday and picked up a solid 7-3 home win. This leaves them firmly in the driving seat for the minor places as they now lead 4th placed Castletown by five points. South have four games left to play and although three of them are at home they couldn’t be any harder as the are yet to entertain Castletown A, Marown A and Onchan A and their results here will be instrumental in deciding the destination of top honours. Ballaugh A had started the week in better form, picking up a vitally important 7-3 win over Peel A to move them out of the relegation zone and towards relative safety. They face a trip to the leaders tonight so are far from safe. North Ramsey A and Ports St Mary A had a mammoth battle at Mooragh park last week with the home side just edging it 6-4 to keep both teams on track for a mid table finish. Castletown A had a good week to remain in fourth place and they added to the woes of Nobles Mixed A defeating them 9-1 at the Crofts. This result keeps momentum going for the towners and leave Mixed dead bottom of the table. Mixed travel to Castletown B tonight and with both teams firmly locked in a relegation battle this result couldn’t be more important, with a big win required for either side to drag them out of the mire. 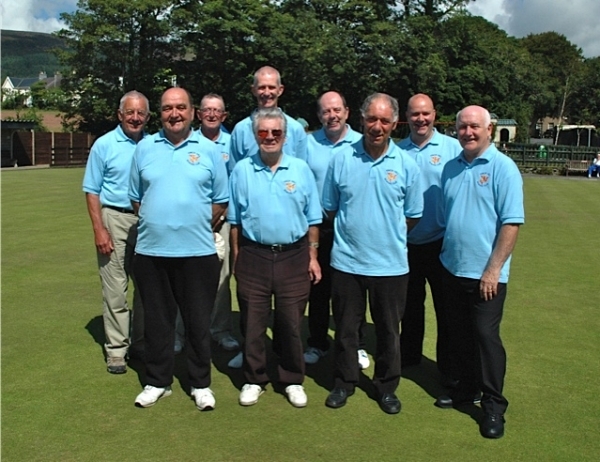 A heavy loss, however, will almost certainly see the recipients playing their bowls in the second division next term. Second division league leaders Port Erin A suffered a shock 6-4 home defeat at the hands of Finch Hill A but still remain on top of the table now level on points with second placed Port St Mary B. Port St Mary B never had it all their own way either but managed to scrap to a 6-4 win over their C team to close the gap at the top. Castletown C still have a lot to do if they want to get promoted but a 6-4 win away at Douglas B will go someway to helping them. They are 8 points off the pace with four games to go and will be hoping to claw back some of this tonight as they travel to Ballaugh B.
Finch Hill A and Onchan B are the only other teams realistically in with a shout of catching the leaders and are 13 and 13 points of top spot respectively. I don’t see them catching the leaders but this division has been full of shock results this season, and one unexpected big win for any of the top 5 would certainly throw the cat amongst the pigeons. Nobles Park A are now odds on to win the third division title after a massive 9-1 away win over Douglas C sees them nine points clear at the top of the table. North Ramsey B have now moved into second place after a hard fought local derby win over South Ramsey A last week. If North do hang on an get promoted it will be a truly remarkable achievement when you think that this is only their first season in the league. Onchan C are the only team who can stop them just two points behind them after a shock 8-2 defeat away at Ballaugh C, however they will need to pull out all the stops as they travel to league leaders Nobles Park A this week. Second division outfit Finch Hill A had their day in the sun lad weekend as the defeated first division Peel A by 18 chalks at Marown Bowling Green to win the coveted Rayner plate competition. They didn’t have it all their own way however as Peel fought hard to claw back the 40 handicap points they conceded winning 6-3 on games but falling short, only clawing back 22 points. Fank Watson’s boys from the sunset City started well picking up wins in all of the first three games to reduce the starting deficit to 22 points and trail 63-85. Just when it looked like momentum was swinging in favour of topflight outfit, Bill Cairn’s Finch Hill men answered the rallying call to win the next 3 and move into an unassailable 41 point lead with just three games remaining. Billy Wilson did a lot of the damage as he defeated Peel’s Ian Christian 21-9 however for me man of the match for Finch must be Paul Dougherty who put in a monumental effort to beat Tom McMeiiken 21-20 in an epic tussle. Although Peel regained supremacy and closed out all of the games still on the green it was a case of too little too late as they were not able to claw back enough points to win this highly entertaining closely matched encounter. Thanks must go to Ron Williams for his continued sponsorship of the event and to Marown for their hospitality in hosting the final. There was an entry of 36 for the IOM Ladies’ Merit, for the Barbara Lee Trophy, played at Port St Mary on Sunday 11 August. Apart from a few light showers the weather was fine although cold for the latter stages, and the green was playing well allowing for some excellent bowling. In the final Jayne raced to a 9-1 lead at which point Lilian won four ends in a row to narrow the gap to 6-9. They then shared the ends to 9-13 before Jayne won the last six ends to run out the winner 21-9. Janet Shilling thanked all who had helped during the afternoon before introducing Rob Lee, Barbara’s son, to make the presentations with the help of Association vice-president Pat Robertson. She also thanked Rob for his contributions to the raffle, the proceeds of which will be given to Hospice, and also for the prizes where he had provided, chocolates for the losing semi-finalists and champagne for the finalists. It was a monumental week at the top of Isle of Man Bank Men’s division one with second placed Onchan A throwing down the gauntlet to league leaders Marown on Monday with arguably their best performance of their ten year reign as champions, before they went head to head on Wednesday. In the first of a double set of fixtures the champions continued their charge with a 10-0 demolition of Castletown A at the Crofts to cut the gap at the top to just four points. They say when the going gets tough, the tough get going and this was certainly true of Onchan on Monday night. Few teams leave the Towner’s realm with a win let alone a maximum and the intensity of the Onchan performance is one that would be hard to match with every single one of their players giving their all, straining every sinew to keep their slim title hopes alive. League leaders Marown A also put in a good shift away from home picking up a solid 8-2 win away at North Ramsey A to keep them in pole position prior to their eagerly anticipated midweek clash with the Champions at the Park. I don’t think I can over emphasise the magnitude of this clash for the local game with the perennial champions Onchan needing a win over the only team to realistically challenge them in a decade to further extend their record run of league wins. If I am honest, going into this fixture, I firmly believed that Onchan would triumph relatively easily and regain top spot, especially with the deteriorating almost torrential conditions. I desperately wanted Marown to be up to the challenge, as I will always have a strong affinity with the great club, but genuinely didn’t think they would do it. Even with this doubt though I knew it wasn’t going to be easy for the second placed outfit, it wasn’t going to be enough for them to simply step up to the plate they were going to have to hit a home run to regain supremacy in the title race. The Crosby men however did not share my doubts and went into the game believing they could win, that they deserved to win, after all the have been the best team in the division without questions this term. There was no way they were going to crumble they were going to scrap for every point; they knew they were in a fight, and fight they did. First blood went to Marown with their Captain and June festival winner Neil Withers producing his best to see off the challenge of double Manx Champion Glynn Hargraves 21-11, in a game on paper that could have gone either way. Phil Kelly kept the momentum going for his side as he took out David Bradford 21-16. This is one that the champions would have thought they should win, with Bradford one of their best exponents at home, but Kelly more than justified his current fourth place in the league merit with another brilliant display. Onchan were never going to go down without a fight and it was time for a family revival as father and son Kevin & Matthew Quirk picked up respective hard fought wins over Mike Cain & Ian Kissack to draw level on games with a narrow 3 point aggregate lead at the halfway stage. The home side weren’t don’t there with Phil Kerruish increasing their advantage by a game and 5 points as he beat last year’s division one merit winner Dean Kipling 21-16. Marown stalwart Colin Kelly returned parity for his side on games and gave them a lead on chalks after a dominant 21-7 win over home captain Peter Slinger to leave everything hanging in the balance with just two games left on the green. Iron arm Gary Conwell put in an amazing second half of his game to come back from 18-9 adrift to beat John Gelling 21-18 and put the champions back in the driving seat. Marown, however, had their own man of steel though as seasoned campaigner Peter Kelly proved age and experience can overcome youth and treachery as he sealed the overall win for his team with a 21-17 victory over Jordan Cain. This 6-4 win leaves Marown six points clear at the top and favourites to win their first title in eleven years and end Onchan’s era of invincibility, however there is still a lot of work to be done. With four games left each, forty points to play for, and Onchan with arguably the slightly easier run in Marown still have plenty of work to do. I think Neil Withers’ charges will do it but I think there could be another twist in the tail yet and I firmly believe that both teams will be going into their final fixtures with the league still to play for. 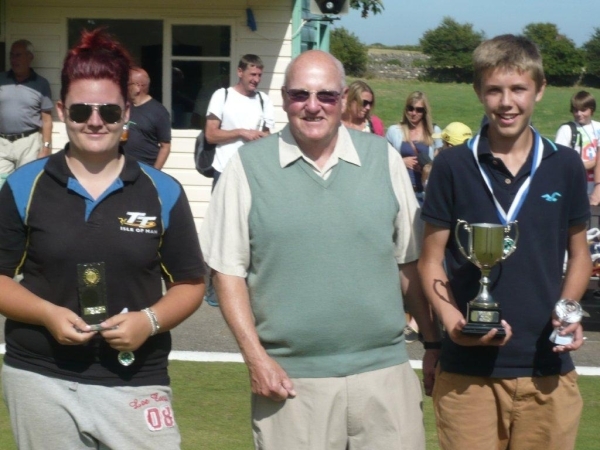 The Bill Oliver Junior Open was played for on Port St Mary Green on Saturday 3rd August and attracted a very good entry of 25 young bowlers. It was a perfect day for bowling and the Green was in excellent condition. The Competition was played in a round robin format and was split into two sections, the younger juniors and the older juniors. 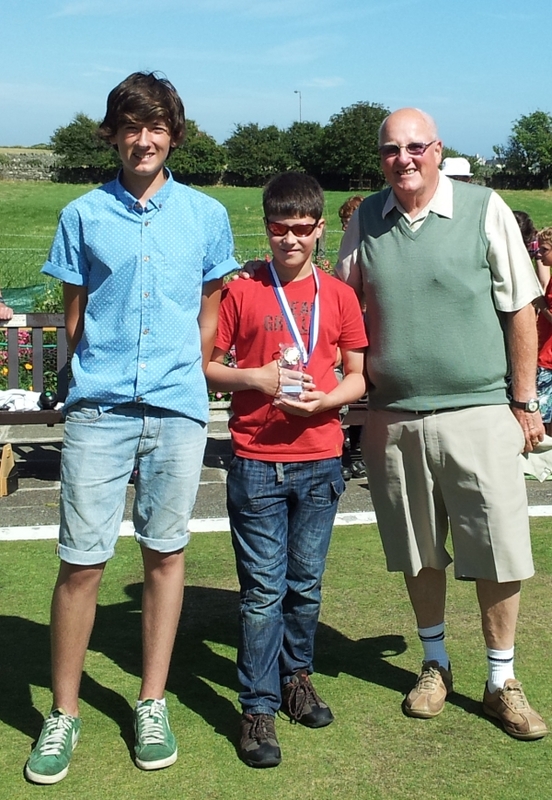 The winner of the younger section was Thomas Young who beat Juan Kneen in the final. The winner of the older section was won by Bobby Thorn who beat Casey Bolton in the final. The standard of bowling throughout the afternoon was of a very high standard and bodes well for the future of Manx bowling. Bobby Thorn in particular is one to watch out for. He played excellent bowls all afternoon. Roy Oliver, the sponsors son, was present from the start of the competition and presented the prizes at the conclusion. All of the competitors were presented with a commemorative medal. Special thanks must go to Louis Callister and Chris Holland for running the comp. in a very professional way and to Jayne Kneen, Colin Holland and George Peach for acting as coaches to the younger section players and Sam Palmer for all his assistance during the competition. A couple of showers didn’t spoil a great afternoon at South Ramsey on Sunday as 32 pairs competed for the Kennish Cup, on a green in superb condition. At the end of the day the same surnames as the previous year will go on the trophy with Jenny Moore and Bob Clark following on from Elaine Moore and Andy Clark in 2012. This was in fact Jenny’s fourth time winning this event, all with different partners; Bob also having been successful in 2008. In a final that went all the way the victors beat the pairing of Viv and Chas Grills who opened with a three on the first end; but then Moore and Clark moved into a 17-12 lead, before their opponents fought back to a deficit of just one. A pair at the next end saw a score of 19-16; but not to be outdone the Grills moved back into the lead at 20-19; two singles decided the outcome and brought to an end a very successful afternoon. Losing semi-finalists were Alison Keggen and Michael Collister, along with Jordan Cain and Paula Firth. Falling at the quarter-finals stage were Irene Brew and Alan Moore; Mary and John Alderson; Casey Bolton and Trevor Quayle; and Elaine Moore and James Teare. The prizes were presented by Fiona and Shelley Kennish on behalf of the family who thanked everyone for any help and those who took part.